I'm an ESTJ. Have you heard that before, all those weird letters? Because it's a thing, apparently, taking this test online and finding out what your 'type' it. 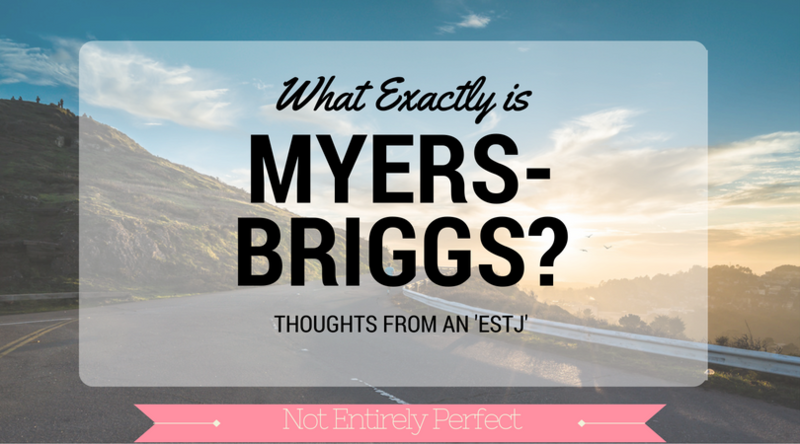 Your 4 MBTI (Myers-Briggs Type Indicator) letters. There's 16 different types. E(xtrovert) or I(ntrovert) - 'I like getting my energy from active involvement in events and having a lot of different activities' versus 'I like getting my energy from dealing with the ideas, pictures, memories, and reactions that are inside my head, in my inner world.' You probably already know which one you are. This is the one that's the closest for me. When I take the quiz, I'm just barely in the extrovert category. Like 51%. And I think I could go either way, depending on the situation. Some people or groups of people make me feel energized and other groups make me need to go into hiding for a week to recover, it all depends. The description for the two types (ESTJ versus ISTJ) are incredibly similar, the main difference that I can see being how I well I lead and boss people around. Extroverts are better at bossing those around them than introverts. And again, it honestly depends on the group of people I need to lead. S(ensing) or (i)N(tuitive) - 'Paying attention to physical reality, what I see, hear, touch, taste, and smell. I'm concerned with what is actual, present, current, and real' versus 'Paying the most attention to impressions or the meaning and patterns of the information I get. I would rather learn by thinking a problem through than by hands-on experience.' I'm an S here. There's been times, of course, when I see patterns and get an impression from a person that will lead me to an answer or decision but almost 100% of the time, I'd rather make a decision based on the facts in front of me. No guessing games. I like facts and details rather than anything abstract. Which is maybe why I hate art museums so much. T(hinking) or F(eeling) - 'When I make a decision, I like to find the basic truth or principle to be applied, regardless of the specific situation involved. I like to analyze pros and cons, and then be consistent and logical in deciding' versus 'I believe I can make the best decisions by weighing what people care about and the points-of-view of persons involved in a situation. I am concerned with values and what is the best for the people involved.' I'm pretty firmly a T here - #lawyer. I think it goes with my being an S as well. I'm logical and methodical, and I rarely let feelings, values, or 'what's best for the people involved' type of thinking get in the way of making the right decision; I value truth over tact. And I tend to be very black and white in my thinking of right and wrong. J(udging) or P(erceiving) - 'To others, I seem to prefer a planned or orderly way of life, like to have things settled and organized, feel more comfortable when decisions are made, and like to bring life under control as much as possible' versus 'To others, I seem to prefer a flexible and spontaneous way of life, and I like to understand and adapt to the world rather than organize it. Others see me staying open to new experiences and information.' Also firmly a J here. Which I don't even think is a question to anyone who's ever read this blog for more than 1 post. I am not at all flexible or spontaneous, let's be real here. I love order, organization, planning, and making decisions. I literally live for bringing things under control. So overall, here's what it says about an ESTJ: Practical, realistic, matter-of-fact. Decisive, quickly move to implement decisions. Organize projects and people to get things done, focus on getting results in the most efficient way possible. Take care of routine details. Have a clear set of logical standards, systematically follow them and want others to also. Forceful in implementing their plans. And here's what it says about an ISTJ: Quiet, serious, earn success by thoroughness and dependability. Practical, matter-of-fact, realistic, and responsible. Decide logically what should be done and work toward it steadily, regardless of distractions. Take pleasure in making everything orderly and organized - their work, their home, their life. Value traditions and loyalty. As you can see, they are pretty similar, and they both very much sound like me. So I completely agree with my assessment and my letters, even if I do think I lean more introvert than extrovert. You can see the descriptions of all the types here, if you're curious where I got this information. So which are you? Take the test and tell me in the comments what your letters are. And if you agree with the assessment!